Student Web Folders are now available via MyDrive, a new simplified system similar to Google Drive or Dropbox. Web folders can be accessed using your MyNOVA username and password. MyDrive provides students space to share files with specific MyNOVA account users. MyDrive also allows students to upload web pages (to their public folder) that are viewable by anyone with a MyNOVA account. View the instructions for Uploading, Sharing, and Public (Web) options below. Click Add Files or drag & drop the files anywhere on the page. Drag & drop works in Internet Explorer 10+, Chrome, Firefox, and Safari. Files are automatically deleted after 365 days of inactivity. To manually delete a file, click the file’s icon (to the left of the file name) and click Delete. Click the Expand icon to display sharing options. Share: To get a shareable hyperlink to this file (to post on Blackboard, for example), click Share. This link will be active for 72 hours unless you specify a different duration (maximum is 30 days). Password protection is optional. Set your preferences and click Share. You will see the Public Link (below). Click the clipboard icon at the end of the link to copy the link. Paste the link into a Blackboard message or email to share it. Email: To email the link directly from MyDRIVE, click Email. Enter the recipient’s email address. All other fields are optional. The link will be active for 72 hours unless you specify a different duration (maximum is 30 days). Set your preferences and click Email. To see the list of files you’re currently sharing, click Share from the menu on the left side of the screen. You can see when you shared the file and when or if it was downloaded. Click the Edit dropdown to extend the sharing deadline or revoke access. The “public” folder is open to the NOVA public, meaning, anybody with DIRECTORY/MyNOVA accounts. Please be aware that anything put in a public folder will be viewable by others. Anyone who tries to view the content will be prompted to enter their MyNOVA credentials. To share a web site to a public folder, click New Folder. Name the new folder “public” (not case sensitive). Upload your web site to the public folder. Click MyWeb Root from the menu on the left side of the screen to view the published site. 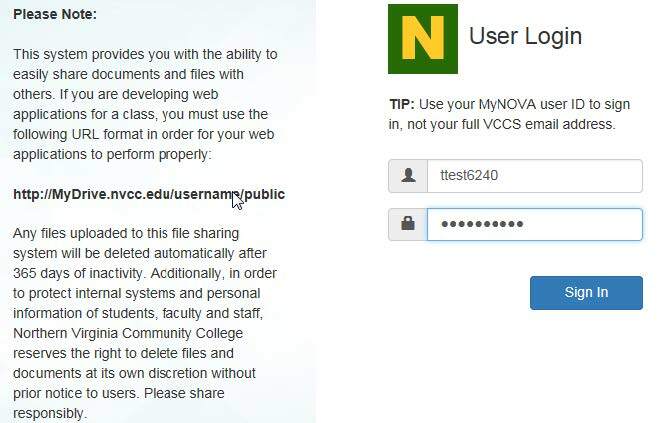 The URL to your public site is http://mydrive.nvcc.edu/username/public (where the word username is the student’s MyNOVA username). You can optionally add subfolders under the “public” folder to publish sites or apps for separate classes. You must use your MyNova username and password to sign in to MyDrive. If your MyNova password has expired, MyDrive will take you to the MyNova page to reset your password. If you have any problems or questions, please contact the NOVA IT Help Desk at 703.426.4141. 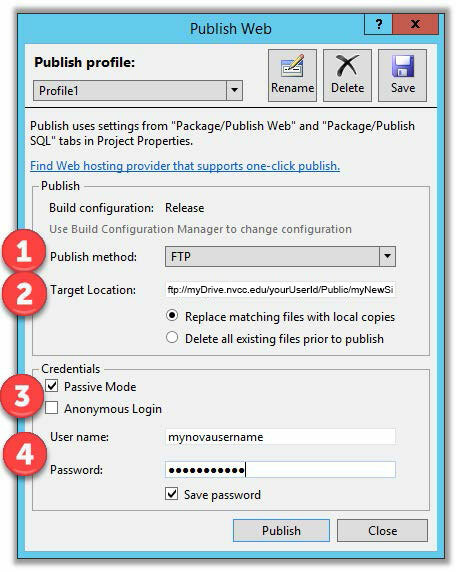 Sometimes students (especially those in web/app design classes) wish to publish directly from Dreamweaver, VisualStudio, etc. FTP Publishing is enabled for this purpose. Both Passive and Active mode are accepted. Anonymous login is not allowed.